¡Hola, chicas! My name is Lauren Eve Pomerantz. This is my world. Okay, question for the information age: would Virginia Wolf have been as depressed if she had lived in modern times when everyone can have a Web site of one's own? Je ne sais pas. Hey, ya gotta love the liberal arts, where there are no right answers, only well thought out opinions. Oh please! Give me physics any day. How do you know if you understand the material if you can't tell whether you've got the right answer? My life divides neatly into three areas: work, vounteering, and family and friends. (Many people in that last group will tell you that this is the only case in which my life is neat.) In and around this are my passions: teaching, reading, penpals, reading, my cats, reading, math puzzles, crochet and knitting, reading, and get off my book, Smaug! 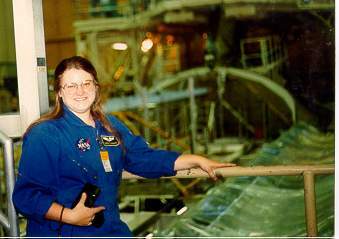 Here I am at Rockwell International's Palmdale plant back in the late 80's. The silver thing behind the railing in the cargo bay of the Space Shuttle Endeavour, then under construction. My latest passion is Soldiers' Angels, a group of people who support deployed military members. I love our guys and gals in uniform! They rock. My fave thing, besides communicating with my own assigned soldiers, sailors, airmen, and marines, is going to some event and getting people to sign cards for our troops. Check out a few of the areas above or visit some of my favourite links. Or if you're already bored, allow me to transport you to the Happiest Place on Earth. Want to contact me? I'm always interested in conversations with interesting people.